Soon the summer will come, and with it the ability to soak, whether on the beaches or in the swimming pools. One of the most successful choices among children, however, is the water parks. If you are fond of them, maybe you should visit the world’s largest, which is curiously not in a place not usually make a very nice temperature. And we are talking about the largest water park covered, that is, that is isolated from the icy outside. 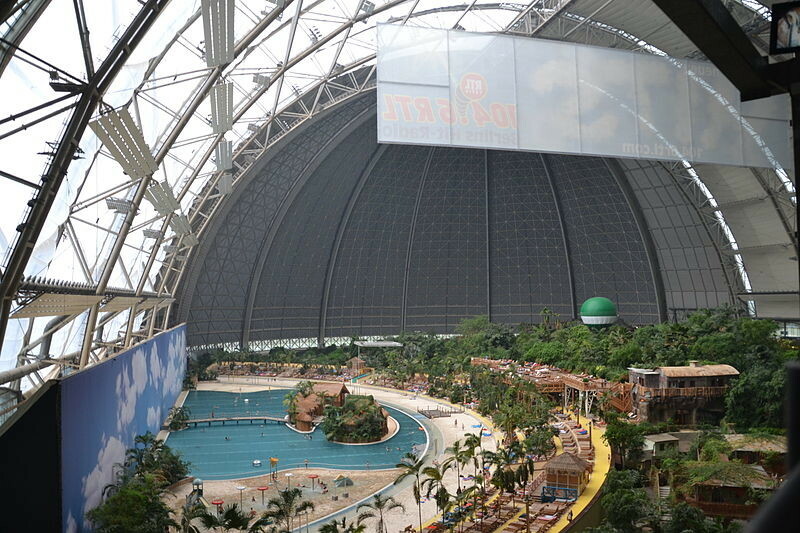 So, Tropical Islands is in Krausnick, Germany, covering an area of 66,000 square meters. This old aircraft hangar (technically, a membrane structure supported by arches) measures 107 meters in height and its structure reaches 14,000 tons of steel. The interior is large enough to house eight football fields, the Statue of Liberty standing or the Eiffel Tower lying down. Opened in 2004, it consists of a mangrove, a forest with 50,000 plants, a lagoon, a spa, saunas and themed accommodations. You can also carry out a balloon trip inside the same dome. You may also like to read another article on NGCATravel: Would you do tourism in a military nuclear power plant? Well some people do! 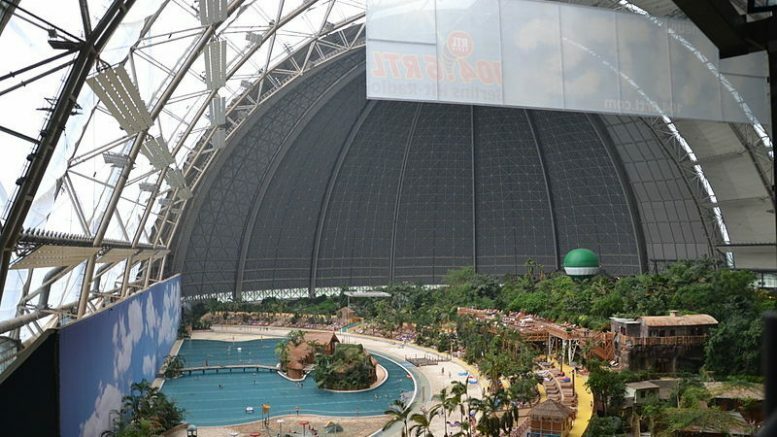 The roof of Tropical Islands is designed with a special aluminum that allows ultraviolet light to penetrate inside for visitors to get a natural tan during their stay, but without getting cold. Not in vain, this huge park has room for up to 6,000 visitors a day. In its first year was visited by 975,000 people. Tropical Islands employs approximately 500 workers. According to the annual report of Tanjong, between February 2004 and February of the following year 155,000 people visited him. It is not, however, the most visited Water Park in the world. That has destination the Water Park Chimelong in Guangzhou, China, which received 2,259,000 visitors in 2014, according to Global Attractions Attendance Report. Be the first to comment on "Do you like water parks? This is the biggest in the world"